I was SO excited for this family session! I first worked with them at their maternity session (view the session by clicking here) and then again at their newborn session (view the session by clicking here). We switched it up this time and scheduled the session to take place in their home with casual dress. Believe it or not, I love jeans and a white t-shirt just as much as I love a pretty studio dress! 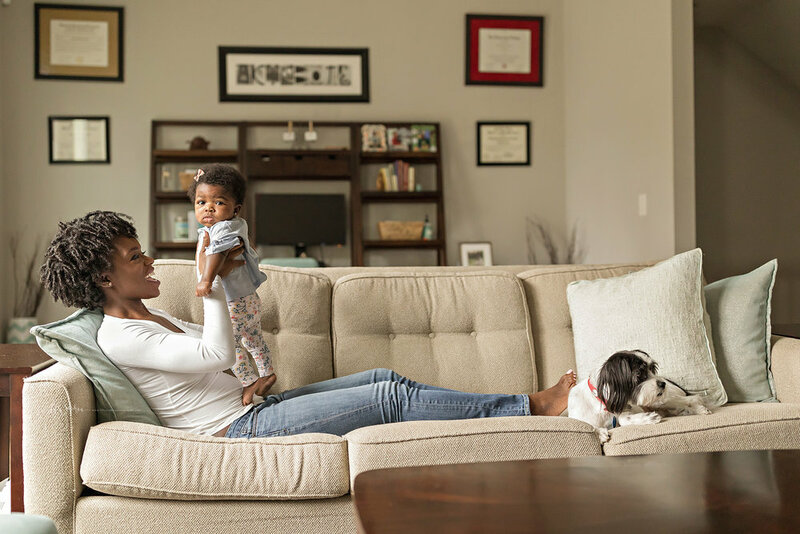 The time of day that I schedule your in home session is determined by the best light in your home and the schedule of your little one(s). Sometimes that will be in the morning, and other times in the afternoon. 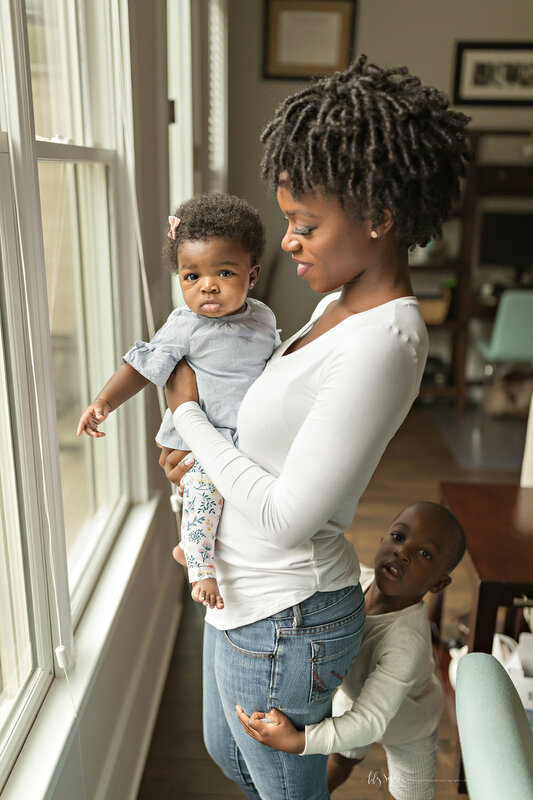 We want happy kids, so it’s best to schedule for right after a good nap and a meal! For this family, that was right around 11 AM. I spent the next hour with the family watching them interact and giving them suggestions of how to play with their children. 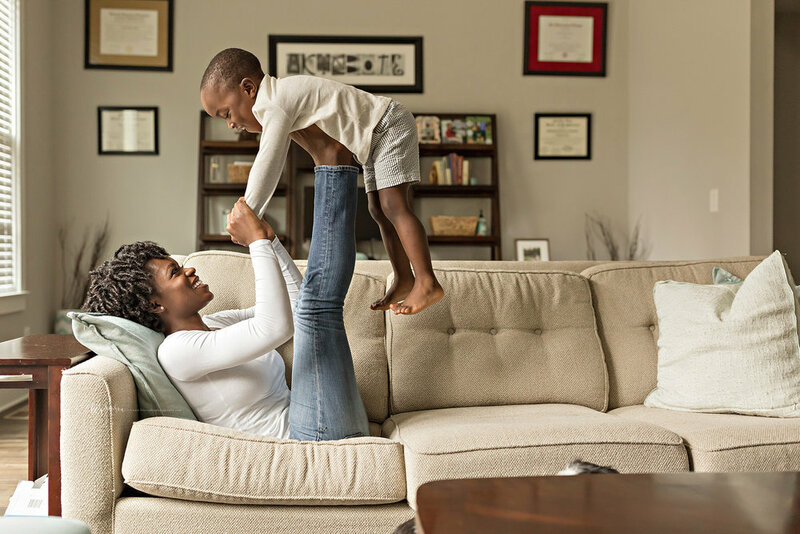 I knew Busola practices yoga, and asked if she could do some fun things with her son, Ayo on the couch incorporating that. Ayo LOVED it, and the joy on his face was just so cute. I love images of families truly at play - especially with their mamas. How often do we get to see ourselves like this with our children? 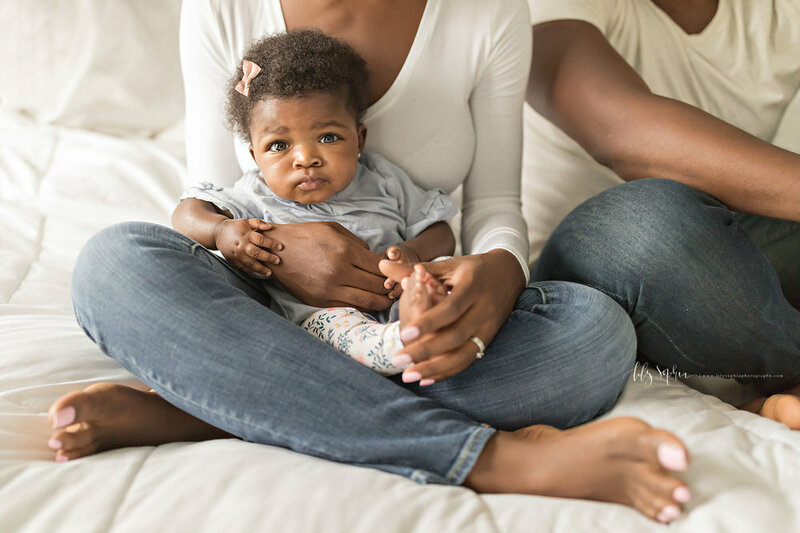 Your home is the safest place your child knows (next to your arms). After we finished up downstairs, we headed up to the bedroom, and I asked if Ayo could jump on the bed. I think Ayo thought I was the coolest photographer ever when his parents said he could! He worked some energy out, and then the family cuddled up on the bed together. It was at this point that little miss Liya spit up all over her outfit, requiring an outfit change. I asked them to hold off on redressing her because I saw the opportunity in front of me. The resulting images of her mama lovingly playing with her on the bed are some of my favorites from the session. 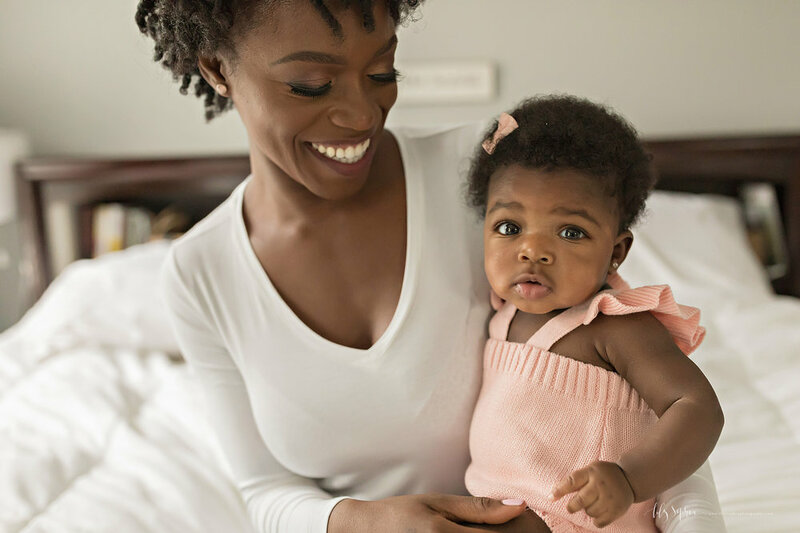 Busola redressed her in the sweetest little knit pink romper, and we finished up all of the family images. I then asked Busola and her husband if they’d like a few images of just the two of them, and they were all for it! They handed their children over to their babysitter who was downstairs, and I took a few images of them together. I absolutely love how much fun the two of them have together. Their personalities are so different, but the common factor is how positive and joyful they both are. They are the type of people that make you have a great day just because you interacted with them. Want to capture your family just as you are now before time completely slips away and you’re packing their bags for college? 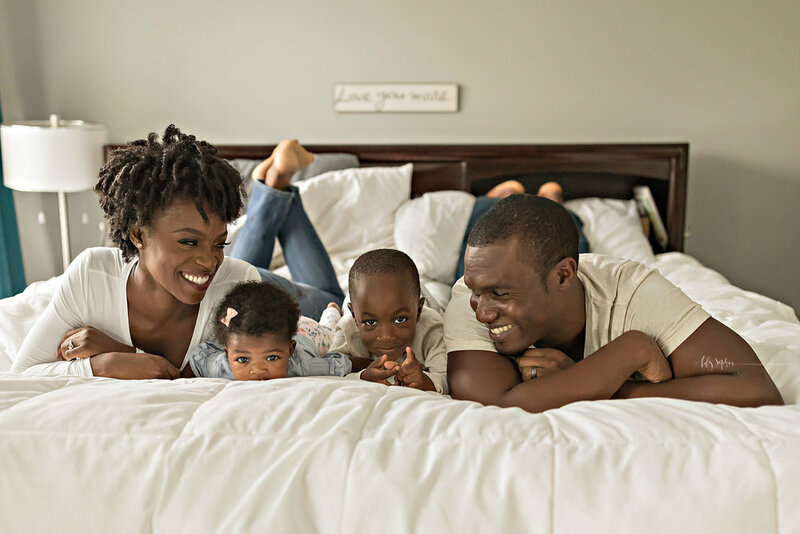 Contact us and we’ll chat about your session goals, your vision, and our approach to see if we’re the perfect match for your family photography needs!